Laguna De La Paz is centrally located in La Quinta. The gorgeous fountain at the entry is located right off of Eisenhower Dr., just down the street from the famous La Quinta Resort & Club. Situated on 50 acres that are framed by the nearby Santa Rosa Mountains, this water oriented community offers a unique desert lifestyle. Laguna Del La Paz real estate was developed between approx 1984 to 1995 and offers both Condos and single family residences. Known for it’s seven acre lake with paddle boats and catch and release fishing, the development also offers many association pools, tennis courts and a lovely clubhouse. Perhaps it’s most well known feature is the walking paths rolling throughout the community, which take you along the lake. Artfully placed benches are perfect for relaxing, and many owners walk their dogs or take bike rides without even leaving the community! 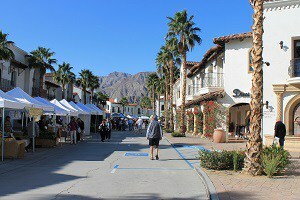 Old Town La Quinta and the La Quinta Resort are a golf cart or bike ride away. Shops, dining, restaurants and entertainment are always available as well as the Sunday Farmer’s Market or a stroll through the La Quinta Museum. A popular choice for Coachella Music Festival buyers and Horseshow and Polo competitors looking for a desert home. Condos and single family homes are offered both lakeside and off and range from approx. 1,660 sf to approx. 2,275 sf. Two to four bedrooms are offered in a variety of floor plans, some with large, enclosed yards. People that like the community of Laguna De La Paz also enjoy Lake La Quinta and The Haciendas.